Featuring 13 mixed martial arts matches, “UFC 236” took place at the State Farm Arena in Atlanta, Georgia, USA on April 13, 2019. In the seventh bout of the evening, Pantoja faced Wilson Reis, 34, of Januaria, Minas Gerais, Brazil in the flyweight division with Jason Herzog as the referee. Herzog put a stop to the flyweight contest after 2 minutes and 58 seconds in the first round when Pantoja knocked out Reis via punches. It was the second technical knockout finish of the evening. Winning at “UFC 236” improved Pantoja’s professional MMA record to 21 wins and 3 losses. On the other hand, Reis now has 23 wins and 10 losses. Pantoja was born in Rio de Janeiro on April 16, 1990. Training out of Nova União in Rio de Janeiro, he has been competing professionally as an MMA fighter since 2007. “UFC 236” marked Pantoja’s sixth UFC outing. When he made his promotional debut at “UFC on Fox 23” at the Pepsi Center in Denver, Colorado, USA on January 28, 2017, he defeated Eric “Showtime” Shelton, 28, of East Moline, Illinois, USA via split decision. Including Reis and Shelton, Pantoja defeated five opponents in the UFC octagon. The other three were Neil “2Tap” Seery, 39, of Dublin, Ireland, Brandon “The Assassin Baby” Moreno, 25, of Tijuana, Baja California, Mexico and Ulka Sasaki, 29, of Shizuoka, Japan. The only opponent who defeated Pantoja in the UFC was Dustin Ortiz, 30, of Franklin, Tennessee, USA. 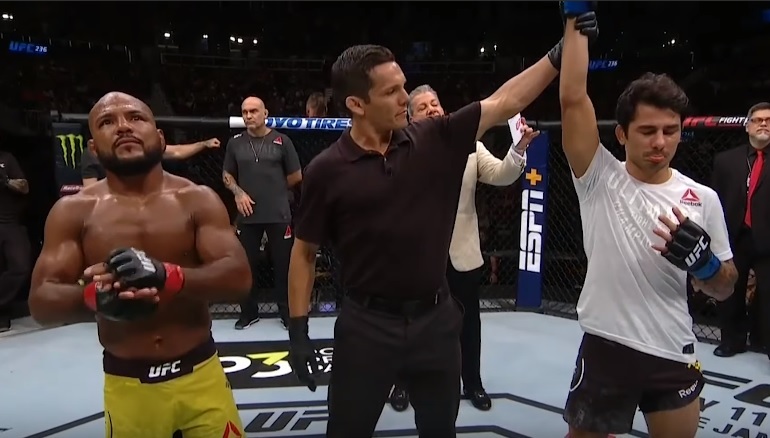 On January 20, 2018, the American contender defeated the Brazilian fighter via unanimous decision.